Yesterday I shared a Holiday Centerpiece I had created to share with a charity that I felt was in need, but today is about the children! Keeping up with the theme of giving back to the community, I wanted to share another way you can give back this holiday. It very quick and fun too! 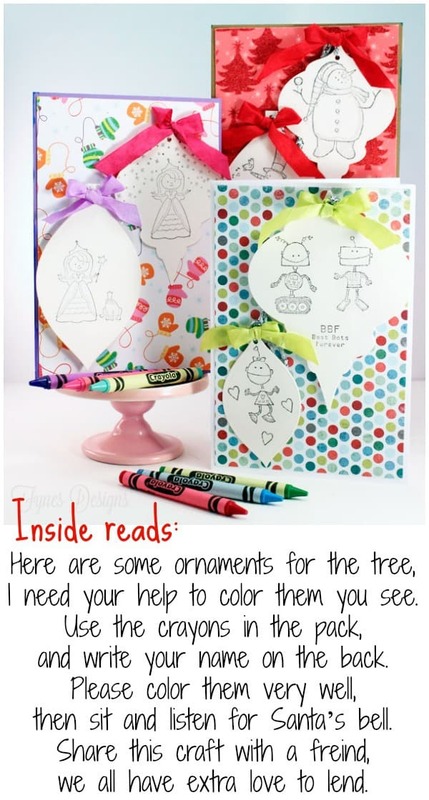 Plus a Kids Christmas Craft that will put a make the kiddos smile too! 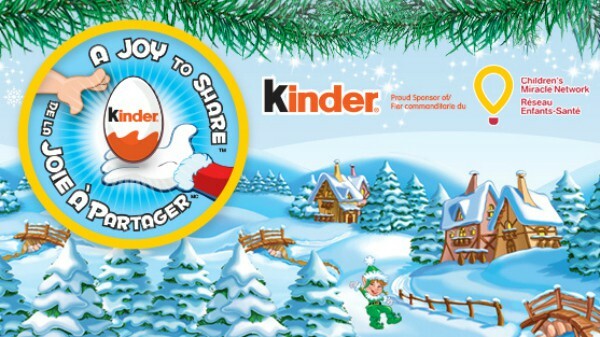 For the second year, KINDER® has partnered with Children’s Miracle Network with the “A Joy To Share” program. The program is one of the ways KINDER® is helping bring joy to families this holiday season. This isn’t just a donation – but a fun way to show your children how they can bring a smile to the face of someone in need. Just visit Kinder on Facebook to create an electronic greeting card to send to a child in a Children’s Miracle Network Hospital. You simply click through a guided app choosing a background, character, sentiment, and greeting. For each greeting card that is created, KINDER® will donate $1 to the Children’s Miracle Network!! Help KINDER® reach their goal of a $25,000 donation this holiday season. We are so fortunate to not have ever used the services of a Children’s hospital but my husband is a Shriner so we know of a few families that use the services. I wanted to find a way to show our children the importance of doing kind things for others during holidays, so I decided to create a kids Christmas Craft of our own to share with children in need of a smile. I cut the ornaments using Spellbinders ornament dies, stamped them with a variety of images suitable for girls or boys, and gave them a pretty May Arts Ribbon bow and hanger. I attached the ornaments with a single glue-dot, to make it easily removable. 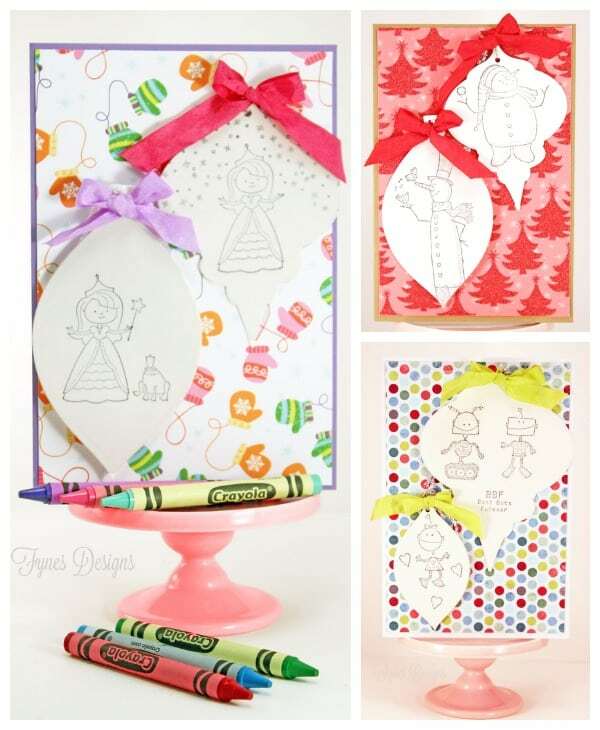 Gift your kids Christmas craft card with a pack of Crayola and the little ones will be so happy to have activity to do and a gift to give! My daughter and niece helped me to colour some, this simple kids craft is so easy to do! Please take the time to create a card on the Kinder on Facebook page, its the easiest way to give back and each electronic card is worth a $1 donation! This is so sweet, Virginia! 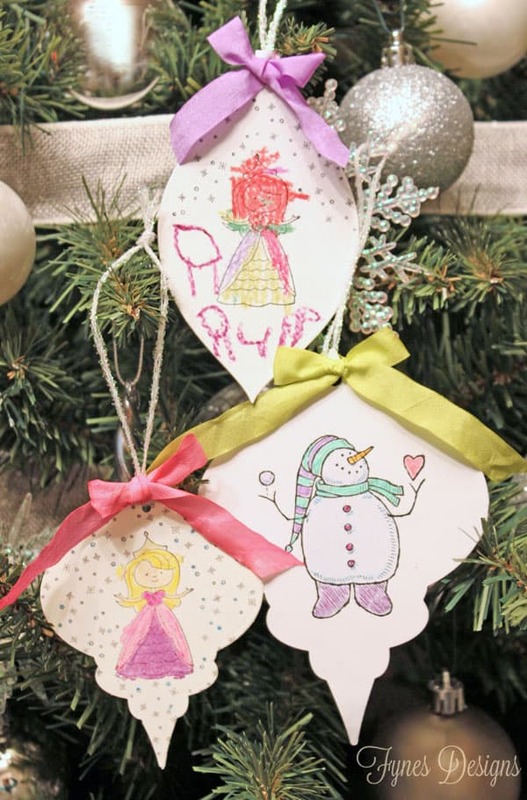 I love that the kids can colour the ornaments – my kidlets love being involved in everything, so this is perfect!